Dr Corey Siegel, Director, Inflammatory Bowel Disease Center, Dartmouth-Hitchcock Medical Center, Gastroenterology and Hepatology, Lebanon, NH, USA. Dr Peter Irving, Consultant Gastroenterologist, Guy's and St Thomas' Hospital London. Prof David Rampton, Professor of Clinical Gastroenterology, Barts and The London, London. Prof Fergus Shanahan, Professor and Chairman, Department of Medicine/Director of Alimentary Pharmabiotic Centre, University College Cork, Ireland. Part 1: Genes and Phenotype in IBD. 1 Which will take us further in IBD – study of coding variation or epigenetics? (Miles Parkes). 2 IBD in different ethnic groups: same or different? (Rupert W.L. Leong, Dorothy K.L. Chow and Christian P. Selinger). Part 2: Bugs and IBD – good, bad or indifferent? 3 How does the risk of infection influence management of IBD around the world? (Kiran K. Peddi and Ian Craig Lawrance). 4 Travelling with IBD (Ing Shian Soon and Gilaad Kaplan). 5 What to do about hepatitis B and hepatitis C in patients with IBD (Morven Cunningham and Graham R. Foster). 6 CMV in IBD – passenger or pathogen? (Ahmed Kandiel & Bret Lashner). 7 Clostridium difficile in IBD: Impact, Prevention and Treatment (Ashwin N. Ananthakrishnan and David G. Binion). 8 Pre- and synbiotics: placebo or panacea (James O. Lindsay). 9 Worms – light at the end of their burrow? (John Leung and Joel V. Weinstock). 10 Do we really need to vaccinate all patients with IBD? (Gauree Gupta and Gil Y. Melmed). 11 Biomarkers in IBD: myth or marvel? (Richard B. Gearry, Andrew S. Day). 12 Radiation exposure in IBD: how do we minimize the dangers? (Owen J O'Connor, Alan N. Desmond, Fergus Shanahan and Michael M. Maher). 13 Surveillance colonoscopy in UC – what’s the best way to do it? (Matt Rutter). 14 New 5ASAs: a tiny step or giant stride forward? (L. Campbell Levy). 15 Do 5ASAs prevent cancer? (Richard Logan and Venkataraman Subramanian). 16 Why do we still use 5-ASAs in Crohns disease? (Stephen Hanauer, Henit Yanai, Emma Calabrese). 17 Steroids in Crohn's disease: do the benefits outweigh the dangers? (A. Hillary Steinhart). 18 Thioguanine nucleotide measurement: Non-adherent, shunter, under-dosed or resistant? (Miles Sparrow). 19 Thiopurines and the sun: what should be done? (Conal M. Perrett, Jane M. McGregor, Catherine A. Harwood). 20 Do thiopurines worsen risk and prognosis of cervical neoplasia? (Jeremy D. Sanderson and Melissa A. Smith). 21 Optimising use of methotrexate (Anna Foley and Peter R. Gibson). 22 Which calcineurin inhibitor and when? (A. Barney Hawthorne). 23 Are all anti-TNF agents the same? (Jennifer L. Jones). 24 One drug or two: Do patients on biologics need concurrent immunomodulation? (Glen A. Doherty and Adam S. Cheifetz). 25 How do we identify patients needing early aggressive therapy and what should we use? (Marc Ferrante and Séverine Vermeire). 26 What is the role of biologics in UC? (Joanna K. Law and Brian Bressler). 27 What can we do with Crohn's patients refractory to antiTNF therapy? (David T. Rubin). 28 Which EIMs respond to biologics? (Tina A. Mehta and CS Probert). 29 Use and abuse of biologics in pregnancy (Marla C. Dubinsky). 30 Is anti-TNF therapy safe to use in people with a history of malignancy? (Mark Lust and Simon Travis). 31 What and how should we tell patients about the risks of immunomodulators and biologics? (Corey A Siegel). 32 When, how and in whom should we stop biologics? (Edouard Louis, Jacques Belaiche, Catherine Reenaers). 33 Avoiding drug interactions (Tim Elliott and Peter M. Irving). 34 Is there still a role for ursodeoxycholic acid treatment in patients with inflammatory bowel disease associated with primary sclerosing cholangitis? (Emmanouil Sinakos & Keith Lindor). 35 Stem cell transplantation for Crohn's: what's the risk-benefit ratio? (Venkataraman Subramanian and Christopher J Hawkey). 36 Complementary Therapy: Is There a Needle in the Haystack? (Shane M. Devlin). Part 6: Surgical Dilemmas in IBD. 37 Optimising IBD patients for surgery and recovery (Jonathan Wilson and Alastair Windsor). 38 Is surgery the best initial treatment for limited ileocaecal Crohn's disease? (Tom Øresland). 39 Laparoscopic or open surgery for IBD? (Donna Appleton and Michael Hershman). 40 Perianal Crohn's disease – optimal management (David A. Schwartz and Norman R. Clark III). 41 Does anti-TNF therapy increase the risk of Complications of surgery? (Ming Valerie Lin, Wojciech Blonski and Gary R. Lichtenstein). 42 Pouches for Indeterminate Colitis and Crohn's Disease: Act Now, Pay Later? (Phillip Fleshner). 43 Dealing with pouchitis (Bo Shen and Simon McLaughlin). Part 7: Unsolved issues in IBD. 44 Mucosal healing in IBD – does it matter? (Geert D'Haens). 45 Vitamin D in IBD: from genetics to bone health via cancer and immunology (Helen M. Pappa and Richard J. Grand). 46 Got Milk? Medication Use and Nursing in Women with IBD (Sunanda Kane). 47 Does stress matter? (Robert Maunder). 48 IBS is common in IBD: fact or fallacy? (James Goodhand & David Rampton). 49 So where is all the cancer? (Judith E. Baars & C. Janneke van der Woude). Part 8: Nutrition in IBD. 50 What should patients with IBD eat? (Emile Richman, Keith Leiper, Jonathan Rhodes). 51 Enteral Nutrition in Crohn's - Who for, When, How and Which Formula? (R. Shamir and Ernest G. Seidman). 52 Optimizing treatment of iron deficiency anemia (Hermann Schulze and Axel Dignass). 53 IBD Standards: will they enhance patient care? (Michael D. Kappelman). 54 Your treatment won’t work if the patient doesn't take it (Rob Horne). 55 Inflammatory Bowel Disease: What to tell your ED team (Louise Langmead). 56 Transitioning from pediatric to adult care (Elizabeth J. Hait and Laurie N. Fishman). 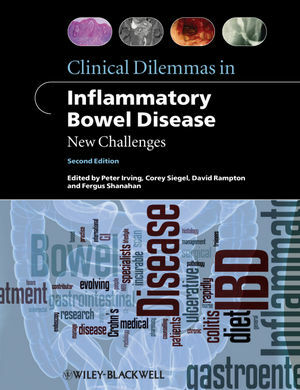 57 Medicolegal Pitfalls in Inflammatory Bowel Disease (IBD) Care (William J. Tremaine).